In Chapter VI of the book 'History of the County of Bute,' John Eaton Reid outlines the "effects of the English inroad of 1544, and notices relating to the island of Cumbray," accompanying Thomas Annan's photograph of Little Cumbray Castle. 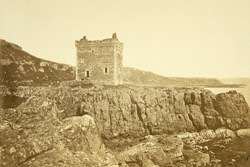 "During the period of the occupation of the castle on the Little Cumbray as a royal residence, the Hunters were the custodiers till the year 1515 (28th Oct.), when Hugh, Lord Eglinton, who had been already made keeper of Rothesay Castle and Justiciary of Bute and Arran, was appointed...reserving certain rights to Hunter. This took place during the troubles consequent upon the death of John Hunter of Hunterston, who was killed at the Battle of Flodden, and when Robert was a minor. Robert afterwards, however, married Janet Montgomery, and in 1527 procured a charter from James V., conferring upon him and his spouse the full possession of the island; but in 1532, Robert, son and heir of William, Lord Semple, got a feu charter of the King's land of Little Cumbray. That grant, however, was revoked by James V. in 1534, when the property was again conferred upon Hunter, confirming the grant formerly made to him; and shortly after he sold it to the Earl of Eglinton...On the appearance of Cromwell and his army in Glasgow, when many of the inhabitants fled for safety, Principal Baillie took shelter for about ten months in Lord Montgomery's castle in Cumbray. It was afterwards surprised and burned by Cromwell's troops in 1653, and since that time has remained in a ruinous state. The burning of it was probably occasioned by Lord Montgomery having confined Archibald Hamilton, one of Cromwell's chief correspondents, in that castle, from which he was taken to Stirling, and there hanged."